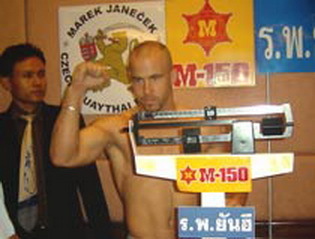 Michael Hansgut vs Xavier Gattez in the B-division of the S-1 tournament in 2004 Bangkok, Thailand. The winner of this fight would go to fight in the semifinal of the B-division. Michael Hangsut has in the past fought Michael Zambidis in Australia. Xavier Gattez has been a past champion of Belgium at 72 kg. ~ by fatsoking on February 15, 2011.